Price: DVD Suite 7 Ultra £88 ($129.95 (Online)); DVD Suite 7 Pro: £68 ($99.95 (Retail)); DVD Suite 7 Centra: £54 ($79.95 (Online)). Currently the only suite in its class to include playback for Blu-Ray disc movies on the PC, DVD Suite 7.0 comes in three versions: Ultra; Pro and Centra. 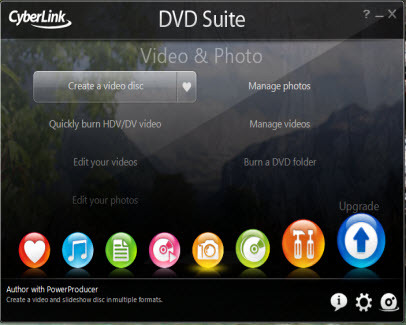 For this review we chose the Ultra version, which is the high end version of Cyberlink’s innovative multimedia software. On starting DVD Suite 7.0 you are presented with the Power Starter task Integrator. This gives you instant access to all of the suite’s many features. Just click on an icon and a sub menu appears giving access to the individual features of each application. The centre piece of this multimedia package is PowerDVD 8.0; this enables the user to view Blu-Ray discs, High Definition videos as well as standard format DVD movies; and all from the comfort of your own PC. Not only does PowerDVD 8.0 provide excellent High Definition (HD) movie playback (on compatible Video and Audio cards) but with Dolby Digital Plus and DTS audio the sound is pretty special too. Of course viewing movies is not the only feature of this well designed suite. DVD Suite 7 Ultra certainly has plenty of options for the budding movie mogul. 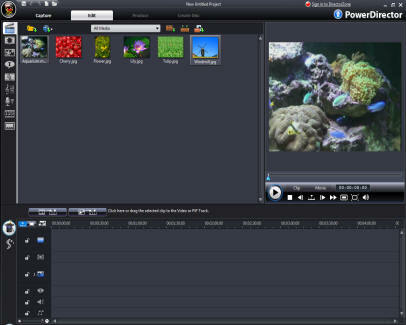 PowerDirector 7, for instance, gives you all the tools needed to edit and trim your home movies, thus leaving any of those embarrassing clips on the cutting room floor. While editing and trimming movies using PowerDirector 7 is relatively straightforward, for the purpose of this review we tested the product on a recorded TV programme with commercial breaks. We found the software, in this instance, had a tendency to regularly freeze after a second or third attempt at trimming the commercial breaks – something that did no occur in recorded TV footage without commercial intervals. At first we thought that the laptop we were using as our test machine may have been the problem, but when we transferred DVD Suite 7 Ultra to a higher spec desktop machine we, sadly, encountered the same problem. Unfortunately a suitable solution to the problem was not forthcoming from Cyberlink prior to this review going to press. If editing and watching your movies isn’t enough, DVD Suite 7 has plenty more up its sleeve to keep you going. 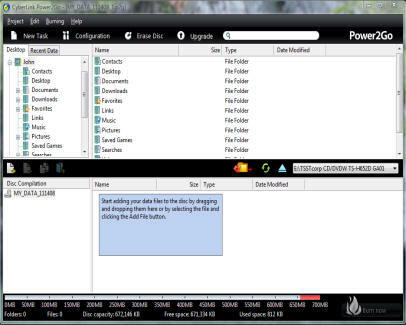 While PowerDirector 7 gives you the opportunity to edit your movie creation, once this has been achieved you are going to want to burn the whole movies to a DVD – well what’s the point of creating a movie if no-one but yourself is going to watch it? This is where PowerProducer 5 Ultra comes into its own. This application allows you to author High definition movies onto both Blu-Ray and AUCHD DVDs. 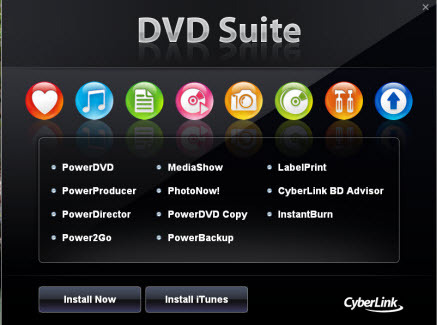 If you are into High Definition and Blu-Ray then Cyberlink DVD Suite 7 Ultra has plenty to offer and is probably the only multimedia suite you are likely to need. With the exception of PowerDirector’s intermittent freezing problem we were quite pleased with the suite’s overall performance. Our only other beef with DVD Suite 7 Ultra was the build 2217.50 update for PowerDVD 8.0, downloaded after the initial install of DVD Suite 7, which immediately disabled the Blu-Ray disc function on the Power Starter Task Integrater on our Windows Vista machine; something that did not occur on our XP Pro machine. Considering this suite is all about HD and Blu-Ray this apparently necessary update was certainly, for us, a step in the wrong direction.